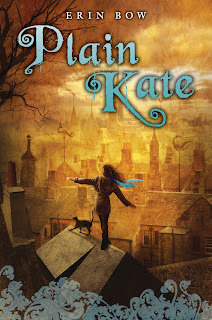 I really love books about witches (wrongly-accused or guilty, historical or fantasy), so I knew it was very likely that I would enjoy Erin Bow’s debut novel, PLAIN KATE. Plain Kate Carver is smart, brave, loyal, and hard working. I realize this makes her sound like a boy scout, but I guarantee she could kick the bottom of any boy scout with whom I’m acquainted. She’s one tough cookie. And her cat is pretty great, too. In fact, Taggle might be my favorite character in PLAIN KATE. He is an absolute princeling. Very haughty. But he is also heroic friend—I’d never risk calling him a “pet.” I particularly loved the dialogue between Kate and Taggle. That’s right, Taggle talks! I thought it was very smart of Bow to give Kate a talking companion, because not only is Taggle’s presence essential to the plot, Kate is a very lonely, quiet girl, and it would be difficult to get to know her without witnessing her conversations with Taggle (the story is told in a third person point of view). I used to read author’s bios in the books I picked up before I ever read their book, but I gave that up when I realized some bios are written specifically for one book—I found that plot elements were being given away in the bios! So when I finally read Erin Bow’s bio on the back jacket flap of PLAIN KATE and discovered she has written some poetry, I was not at all surprised. The writing in this book is so musical and is rich with unique imagery. It’s really some of the loveliest writing I’ve seen in fantasy YA. Without giving anything in the plot away, I also have to say that the villain in this story was amazing. Utterly terrifying, yet my heart broke for him even while he was committing his villainy. Plain Kate’s culture and society also takes on a villainous role in the novel, which I felt gave the book more of a realistic feel than a novel where one character simply opposes another. If you’re a magic-lover or are fond of witchiness, like me, I hope you’ll give PLAIN KATE a try! I would especially recommend it to individuals who read and enjoyed Tamora Pierce’s novels. Also, doesn’t this book have a gorgeous cover? I love it! I'm so glad you liked it! I loved it, and I know a lot of people who don't get it. Oh well--they lose! I really liked this book. It made me sob at the end (I'm not sure why I consider that a good thing in a book, but I do.) And Taggle - loved him!